Cinelicious Pics has brought out a true anime masterpiece. They have crafted this truly one of a kind anime on a lovely Blu-ray experience. An all new 4K restoration that is breathtaking and beyond words, you have to see it to believe it. This is one of those forgotten about classic animated films. It's a film that is a one-of-a-kind, unique, very diverse, very artistic, very intense, very graphic. To me it's one of the great masterpieces of anime in existence. If you have not seen this anime it's very hard to explain and very hard to grasp the Ultimate Reality of the story. The Animation is truly an artistic Beauty that stands out above and beyond a lot of other anime films. To me this is one of the most unique masterpieces of anime that has ever been created. Thankfully this is coming out on a wonderful high quality Blu-ray that I highly recommend. The film has never looked this great. A passionate and wonderful example of how to treat an important piece of anime film history. This Blu-ray gives a new transfer, high definition, amazing audio and video. It is vibrant in color and artistically sound in the way the movie originally was. 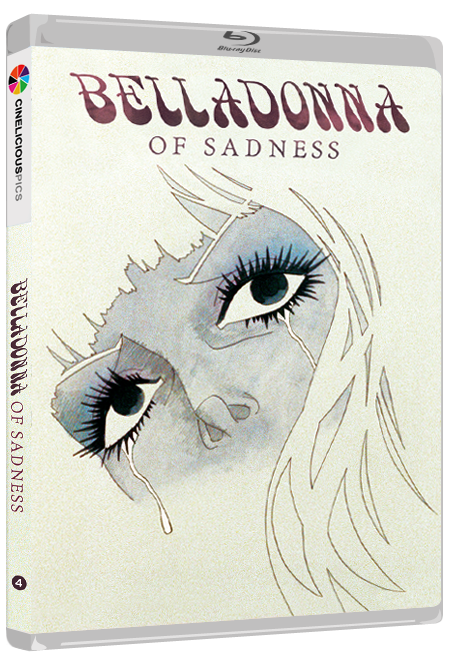 The plot to Belladonna of Sadness is a rough and brutal reality. Your main character Jeanne is happily a newly web with Jean. They live in a rural village. Sadly, on her wedding night she is raped by the local Baron and his group of bad guys. So begins a spiraling downward of reality. Soon Jeanne has visions of a spirit. That spirit grants her special happenings. As the baron returns from war Jeanne who has a new found purpose and respect is accused of being a witch, and is banished from the village. Soon Jeanne finds herself along side her spirit in a new purpose. The movie is based on the book Satanism and Witchcraft by author Jules Michelet. Director Eiichi Yamamoto co-wrote the screenplay for the film. Yamamoto needs no introduction to true movie lovers. He is a master director and writer of Anime. From the classic, original Astro Boy to my personal favorite 1966’s Kimba the White Lion. He was a true master at capturing reality to his anime. He was able to transcend an emotional undertaking into his anime films that made you the viewer feel for the character, and also the horror’s, or realities taking place. As of this writing he is still alive but retired. He left a great array of anime to enjoy and the passionate, powerful example of that brilliance is Belladonna of Sadness. Belladonna of Sadness is an ultimate trip into an odd world. The music soundtrack is an intense, avant-garde smack in the senses, that add a unique story in itself. The brutal reality of the subject matter mixed with the intensity of Masahiko Satoh’s soundtrack leaves the viewers ultimately exhausted, and that is part of its brilliance. Newly restored by Cinelicious Pics using the original 35mm camera negative. Adding in over 8 minutes that original was cut from the feature. An utterly fantastic, trippy, experience like nothing you have ever seen. Belladonna of Sadness is a true masterpiece of animation that gives the darkness along with the light. You experience the deep, twisted nature of humanity and also the darkest reality of clarity one can ever experience. 16-page booklet with an exploration of the film. This article is written by Dennis Bartok who is Executive Vice President of Acquisitions & Distribution for Cinelicious Pics. This is a very informative booklet that I read twice. Great knowledge about this movie and also it’s Lost and Found nature and restoration. This is a must own experience. Cinelicious Pics has created a Blu-ray worthy to praise and experience. 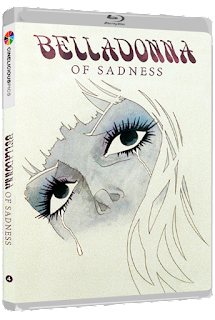 This is a highly recommend Blu-ray, in my viewpoint it’s a must own for any lover of cinema, for Belladonna of Sadness is an experience like no other.